The first time I tried glass etching was in the early 2000’s. I was so worried I might ruin the item but quickly calmed my crafting fears with the idea that it was just a dollar store jar and I could easily replace the item. As you can see here, it doesn’t always work the first time! 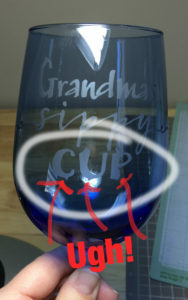 The most common mistake when etching for me was my seams would lift on the curved glasses, and the etching cream would bleed past the vinyl and make the image look smeared. I made lots of baking dishes as gifts with names on the side and fun graphics on the bottom. These are easy since they are flat. Glasses or jars that have a curve are the ones that tend to bleed so I go over the edges a few times on those. 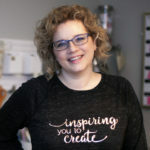 Over the years I have found lots of “what not to do” and nailed down about 6 steps to help me mass produce items quickly for sale. Below I’ll share those steps with you as I prepare a set to take to a local shop to sell. Let’s get started! Step 1: Download Your SVG! You can download my “Hubby” or “Wifey” WCMT SVG template here (or create your own) . I cut mine in Cricut® Design Studio. Step 2: Cut Your Image. Step 3: Apply the Stencil. 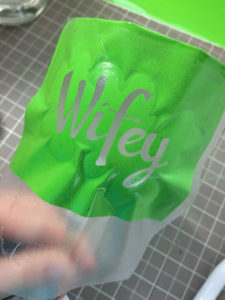 Place your vinyl stencil on the surface of your glass item, I sometimes cut lines on the edges so it lays flat if the item has a steep curve, this glass wasn’t too bad so I left the stencil as is. Step 4: Prep the Edges! Be sure to smooth along each of the edges so the etching cream doesn’t seep in. Step 5: Applying the Etching Cream. Apply a coverage to the part you want to etch. I use a popsicle stick to goop it on. Be sure to pick out the chunks for a smooth finish. (I do not put it back in after I use it. The jar goes a LONG way, so I’ll buy another with my Hobby Lobby coupon when I run out. HA). I believe I’ve done over 5 dozen glasses already and still on the same jar. I used Armour Etch Etching Cream for my items. There are lots of options out there but this is what I used here and I like it. Step 6: Let the Magic Work. Let dry according to the instructions (or I leave mine on for 10-20 minutes). Now wash off with warm water while you peel away the vinyl. I use a paper towel to be sure to remove all the etching cream. I peel the vinyl while the water is washing away the etching cream. The warm water helps remove the template. That’s all! Not sure why it took me so long to try this – it’s really that easy. Please feel free to share pics of your etched items below. And if you’re looking for a custom file to cut, contact me for details, I’d love to help! 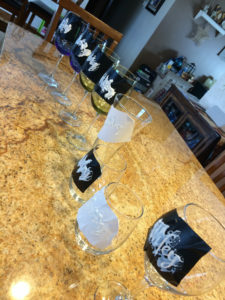 Now, no one should steal your wine glass again! 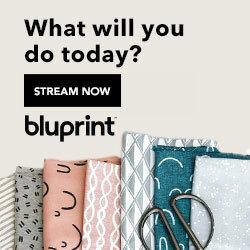 Disclosure: There are some Affiliate Links listed on this website. « FREE SVG files here! So…can I pay you to make these glasses for me? 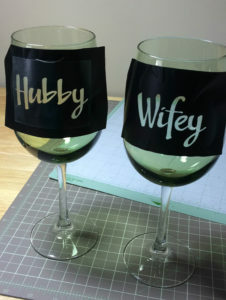 I’m not a crafter and I don’t have a cricut.